We all use a variety of social media outlets daily. Have you ever thought about using them in your classroom, though? 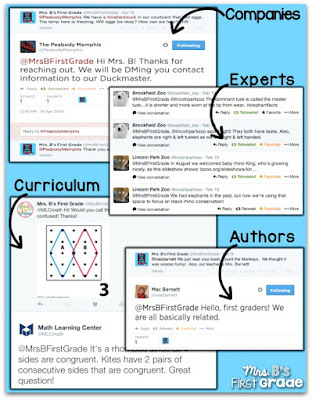 My name is Sarah from Mrs B’s First Grade, and I am excited to be guest blogging today to give you five steps to successfully implement a class Twitter account! 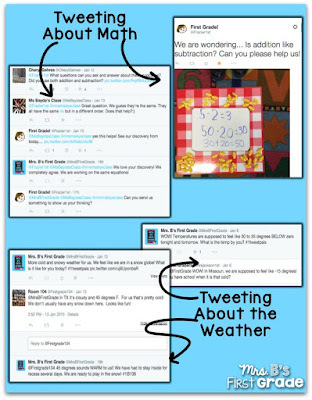 Setting up and using a class Twitter account can seem like a daunting task; it is easier than you think, though! Social media is a part of our students’ lives, no matter if we use it with them or not. I believe strongly in students learning how social media works alongside us. This way we can help them understand what making good choices means with this tool. We want to teach them empowered use and how they can become online collaborators, creators, and contributors. The very first step you need to take is create a Twitter account. I have two accounts: one that is my personal learning network and one that is for my classroom. When creating your handle (this is your username that follows the @ symbol), be mindful that it is related to your class and education. My handle is @MrsBFirstGrade, which clearly signifies that we are a first grade classroom. You want others to be able to know who you are and what you are about within seconds of looking at your profile. Another first step you need to take is to talk to your administration and take a look at your Acceptable Use Policy that your district has your students sign. It is important to make sure that you are not violating any privacy guidelines by tweeting with your students. Although Twitter is covered under my district’s AUP, I also send out a permission letter to my parents at the beginning of the school year. This is just a precaution that you can choose to take. It is important during these discussions and/or letters written that you explain the educational benefit behind using Twitter in the classroom and exactly how you plan to use it. After you have taken these steps and are ready to go, you need to explicitly teach your students expectations for using the social media outlet. Below is what I use; click the picture to grab your own copy! Get tweeting! It is perfectly normal and acceptable to start very small. You can lurk others and retweet. When you feel comfortable, it is great to tweet out what is going on in your classroom so that parents can see what is going on. This is exactly why I started tweeting: I wanted my parents to know about all the amazing things that were happening! Parents can easily sign up to get tweet notifications from your account. They do not have to be constantly scrolling through to see your tweets. After you feel comfortable tweeting, start interacting with other classes within your school or with your students. You can start a “Twitter Tuesday,” where each class in the school answers a question using the same hashtag. Or, your class can use it as an avenue to pass on interesting information or book recommendations to other classes. 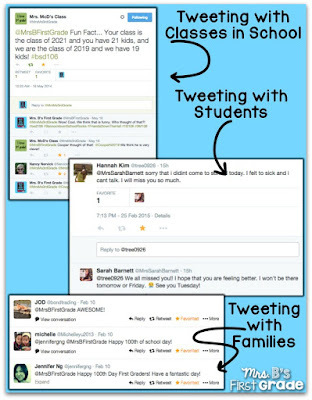 Depending on the age of your students, you can also tweet with your students and/or parents. I have had students that were too shy to interact with me within the classroom, but they came alive through Twitter after school. Side note – if your parents start following you, you do not have to follow them back. Think about what might come up in your Twitter feed if you log on with your class. There may be some pictures posted you do not want your students seeing! After mastering how to tweet with others, begin interacting with other classes that are similar in age to your students. If my class is scrolling through our Twitter feed because we have an extra minute or two, we inevitably see another class working on a skill we are currently working on. Sometimes we just comment to ourselves that they are working on that skill also, and sometimes we tweet to the class to talk more about it. If you would like to tweet to a class for the first time, a great talking point would be about where they live, what the weather is like there, current events that are happening, etc. These beginning questions help to create relationships that can lead to more interaction and learning. It is great to interact with other teachers and students, but your students can also learn so much more from various experts. Many authors, companies, app creators, and textbook publishers are on Twitter and love to hear feedback and talk further with students. After my students and I have read a book we particularly enjoy, we often look to see if the author is on Twitter. If they are, we send them a tweet saying how much we enjoyed the book. It is such a great example to students that authors are real people, and they could be one someday. App creators and textbook companies also love to hear feedback and help you with their products. Tweeting with them is a great way to teach your students about consumer education and create better products for your classroom at the same time. Zoos, museums, and companies are also wonderful experts to tweet with. When my students and I run into a question about something that to which we can not find the answer, we will tweet with one of these experts and more often than not they tweet back. Connecting with them can also lead to memorable experiences, such as Skyping opportunities. Just like tweeting with authors, these interactions can show students a great example of what various jobs look like and what it means to do them. Want to take it just one more step further? Now that you have made amazing connections, you can do more than send them a 140 character tweet. 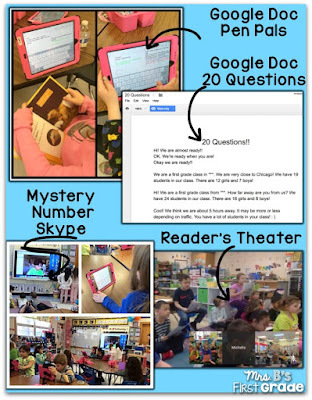 Interactions with other classes have led my students to many opportunities such as using Google Docs to play educational games, using Google Docs to have 21st century pen pals, mystery Skyping sessions, nationwide Kahoot calls, book clubs, and participating in a reader’s theater with another class. The possibilities are endless! Many teachers will ask how to make these opportunities happen for their students. My answer is always that you find them through social media. 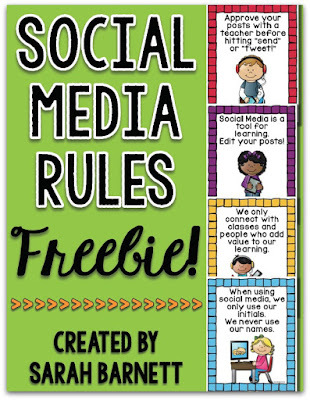 It can be your own personal social media or your class Twitter account. If you reach out to other teachers, or just put a tweet out there with hashtags that teachers may search for, you will inevitably have someone answer you! It really is that simple. I hope that you have been able to take away some tips for using social media in your own classroom. The time spent on this can be very minimal – transition times are perfect, such as when you are waiting for everyone to join you for a lesson. During a lesson when you have a question and want to reach out to someone is a perfect time, too. Once you get started, it will come naturally to you. If you already use social media in the classroom, how are you using it? I would love to hear more examples! Sarah, a National Board Certified Teacher, is her in her eleventh year of teaching. As a 1:1 iPad teacher, she is passionate about technology and sharing what she does with other teachers. She has Master Degrees in both Reading and School Leadership. She blogs at Mrs. B’s First Grade and sells at TeachersPayTeachers. The Only 5 Apps You Need Increasing Student Engagement with Interactive PowerPoints Plickers – A Fabulous App for the Classroom Integrating Technology in the Classroom with ScreenChomp Using QR Codes in Your Classroom: It’s Easier Than You Think!